When the voltage reaches 13, 8V and that the current drops to 0, 025C (10A for a battery of 400Ah), you stop the load. Good… in practice load systems that were designed for the lead-acid batteries are not able to operate in this way. But with wise choices of material and a few precautions can be approached. It is important to ensure a good battery charge, without overcharging her and remaining in the range of operation of the shippers. In this article, After a reminder of the characteristics of a lithium battery charge I will detail the precautions to be taken to use existing equipment, and finally to address the specific case of the alternator. 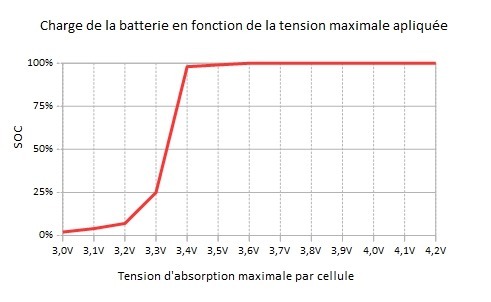 This graph is extracted from data published by Powerstream in 2014 – www.PowerStream.com -who has tested four brands of lithium cells by charging them with different maximum tension (3, 0V to 4, 2V) and by measuring the State of charge thus obtained (SOC%). The results for the different brands are very close to each other and I here represented a median curve. A voltage higher than 13,8 plug (3,45 volts per cell) will definitely charge the battery more quickly, but is sufficient to override it. A 0,1 Volt almost going from the underload the overload of a cell. It is therefore unrealistic to want to avoid the overhead adjusting tension, while ensuring a close to load 100% SOC. Until the battery level reaches 90-95% the voltage of a lithium cell varies very little and it absorbs all the power that we him provided. Voltage constant (CV) : the voltage is fixed (13,8 plug) and the current will rapidly decrease - the battery is full (100% SOC) When the current falls below 0, 025C. Is- What battery will reach 100% SOC if I don't charge to 13, 8V ? Rod Collins (HTTPS://marinehowto.com), a specialist electrical engineer marine who installs and tests for many years lithium batteries, made regularly tests of capacity on a fleet of battery lithium 400Ah (Winston). A room temperature of 25 ° C it charges the battery at 13, 8V and stop the load when the current falls to 10A (0,025C). It measures the time of discharge of the battery with a constant current of 30A and stops when the voltage reaches 11, 2V (2,8V per cell). 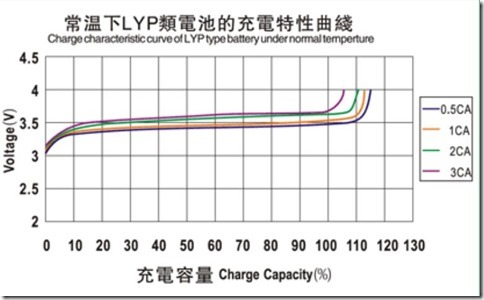 The capacity is the time of discharge x 30A. So if the battery can deliver more than its rated capacity by loading at 13, 8V, Why apply a higher voltage and risk of damage ? The batteries do not need to be recharged at 100% for well - they prefer to be between 50 and 60% SOC. I charge my battery lithium to 100% SOC approximately once every six weeks to validate the calibration of the battery monitor and control the cell balancing. Two challenges facing us : How to stop the absorption phase until the battery overload, and how to eliminate the phase Float. When my battery is near them 100% SOC, I'm watching closely the voltage and current. With a charge current between 80A and 100A, Once the voltage reaches 13,8 volts and that the regulator maintains it, the current drop very quickly to pass under the 0, 025C in 30 minutes. If the load current is lower (solar panels), It is almost to 0, 025C when the voltage reaches 13,8 plug. Keep the voltage to 13,8 plug (or more) Once the charge is complete can damage the battery. Set the maximum length of the phase of absorption of the Chargers and regulators. It is generally not possible to eliminate this phase. The way around this problem is to set the Float voltage low enough to avoid overloading of the battery. As seen above, a voltage of 13,2 plug (3,3V per cell) does not charge battery. 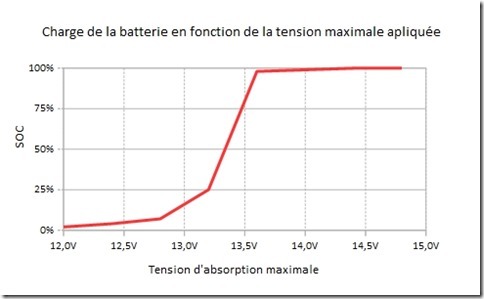 So this tension, If applied for long periods, should be sure to not overcharge the battery. Some Chargers have an option to load the lithium batteries. Often tensions preset for this option are too high. Profile 'lithium' a great brand charger has a voltage of absorption of 14, 6V and tension Float from 14, 4V!!! Fortunately all these tensions are also programmable. So check the voltages for the option "lithium" of your chargers and regulators. Many shippers and regulators (If not most) measure the voltage of the battery to the level of the cables that connect to the battery. As there is a voltage drop in the cables and connections between the battery and charger, the voltage at the terminals of the battery is lower than the voltage controlled charger. With 14 metres (2 x 7 m) cable of 50mm 2 between the charger and the battery and a couple of fittings (battery lugs, cut-out, fuse, shunt, solenoid, bus…) the total resistance of the circuit between charger and battery is of the order of 4,5 mOhms. With a charge current of 100 A, the fall of tension between the charger and the battery is 0,45 plug. In these conditions, If the charger controls at 13, 8V, the tension will be only 13, 35V to the terminals of the battery (3, 34V by cell)… NOT ENOUGH TO CHARGE THE BATTERY. A good idea would be to increase the voltage of the charger control, either, in the example above, at 14, 25V to have 13, 8V battery. 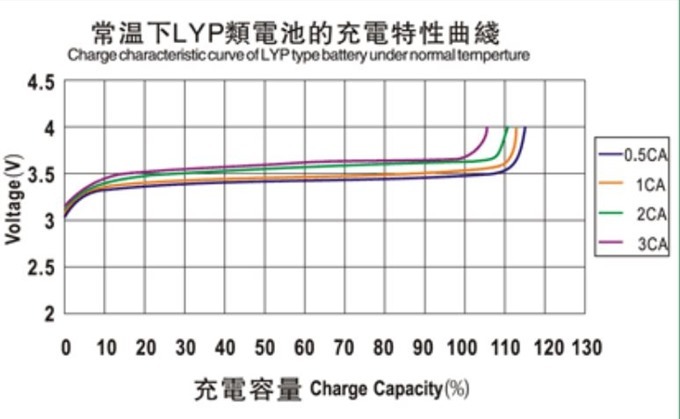 It's good when the current is 100 a., but when it drops to 20, the voltage drop is only 0, 1V and meet with 14, 15 v at the terminals of the battery ! The solution is to have shippers and regulators who have an external voltage probe. This probe is connected directly to the battery and does not know - so measure the voltage of the battery without voltage drop. Procure Chargers and regulators who are equipped with an external voltage probe that does not power. 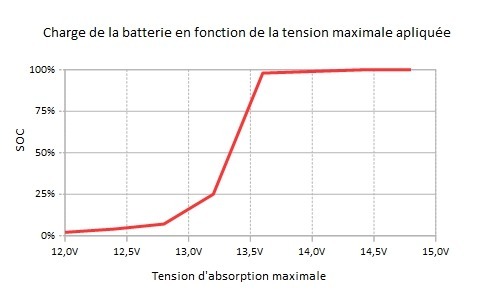 On TAO, the Victron MPPT solar controller 150/70 has no external voltage probe and by adjusting the tension of absorption at 13, 8V, he switches to Absorption, then Float until the battery is full. 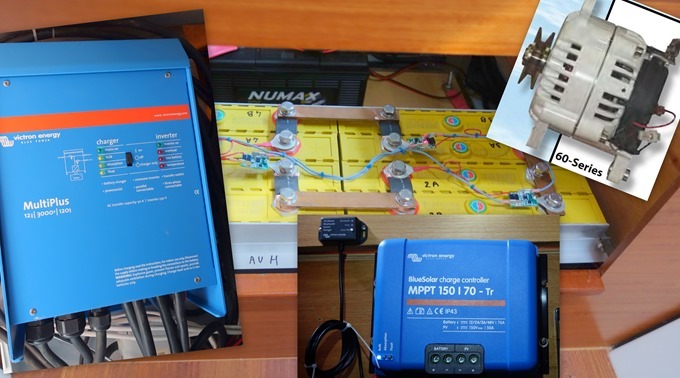 I reconciled the solar controller battery, increased the section of cable that connects it to the battery and set the absorption voltage to 14, 0V - the regulator switches to Absorption mode when the battery is full and there are no embarrassing surge at the level of the battery. To charge a lithium battery it is unnecessary and could be harmful to compensate the load parameters depending on the temperature. A few quite simple changes can be used to work around the limitations of our regulators (as I did with my solar controller) without endangering the health of the battery lithium. But if your existing systems do not allow to program the parameters of voltage, time and temperature compensation, the best choice is to replace. Make sure the new loaders / regulators are equipped with an external voltage probe that does not power, and allow to program all of their parameters. Maybe have you noticed that the 80A alternator fitted as standard on the engine of your yacht provides for most of the time a current of less than 40A ? 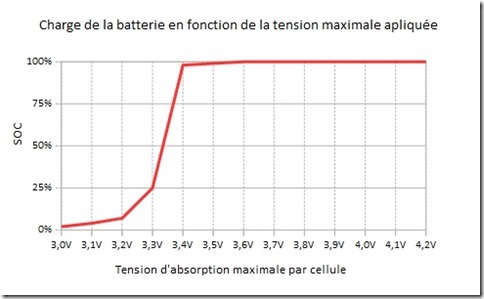 This is the strong internal resistance of a lead-acid battery… which increases at the same time as the battery charge. So although an alternator 80A virtually never works at full load - but mostly less than 50% capacity. Series alternators are usually designed for this mode of operation. 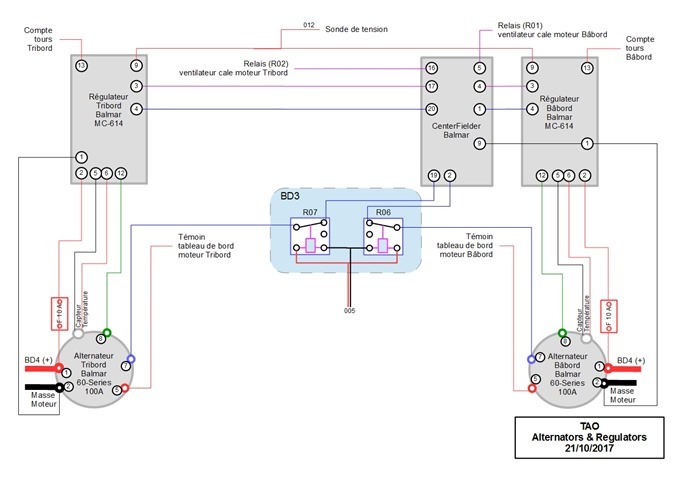 If this same alternator is connected to a lithium battery (who has a low-resistance internal), the charge current will be limited only by the capacity of the alternator. It will therefore provide all the power he can muster when operating at full load practically until the battery is full. Super ! 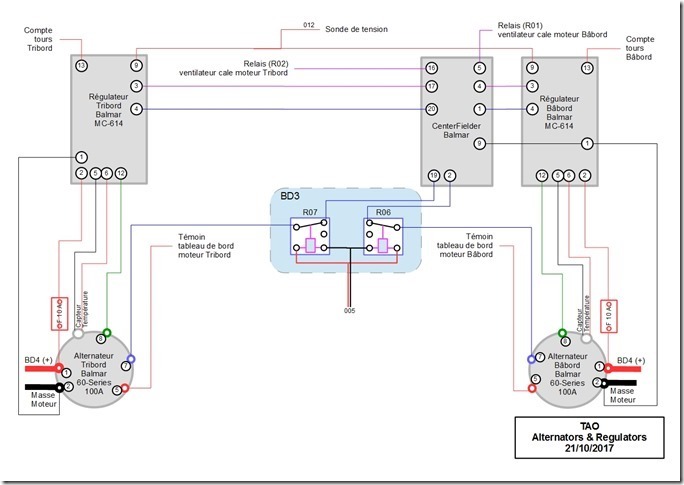 You say… but the problem is that no alternator series is designed to operate at full load for long periods. It will heat up and eventually give up the ghost. The only solution to not burn his alternator is able to limit the maximum current that it provides and so do work below full capacity. This requires an external regulator. If you know of other, Please let know me. So, for TAO I made the choice to install alternators Balmar '6-Series' of 100 in direct replacement of 80 A mounted in series on the Yanmar engines. These alternators are fitted with a double fan to cool and are designed to provide constantly high a current at a low speed (What is the speed of cruise on a sailboat). Each alternator is driven by an external regulator Balmar "MC-614" that meets the above criteria. In addition I installed a Balmar 'Centerfielder II' case that, When both engines are running, synchronizes the alternators for maximum efficiency. UM… and the initial cell balancing, He did how?